Toledo stands proud on the plains of La Mancha, a testimony to the possibility that three cultures can coexist in peace. Toledo stands proudly on the Tagus River banks on the La Mancha plains. TOLEDO APPEARS in the morning mist, like a mirage. 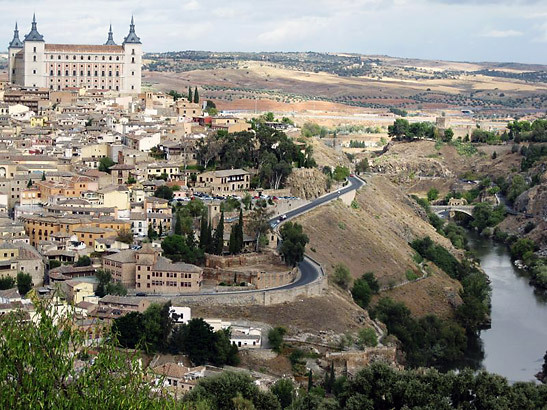 Rolling hills of Castilla La Mancha make way to a majestic walled city here in central Spain. We see and feel the look of antiquity as we make our way up a series of six separate and very modern escalators.Spain is the world's number one tourist destination and one of the elements to insure this top rating is Spain's ability to balance new, modern buildings with revered ancient structures. Toledo is known for its enticing pastries, many almond based. EUROPEANS know Toledo as "the second Rome." On the banks of the Tagus River, it towers majestically heavenward. Toledo indeed is an ancient and proud city, known for its mostly peaceful merging of cultures. Jews, Christians and Muslims have long inhabited its winding streets and stunning vistas. down to Toledo's plazas and churches. hosts celebrations, concerts and gatherings through the year. As capital of this beautiful region of Spain, it is also famous as the home of the well known Renaissance painter El Greco, or "The Greek." One of El Greco's most famous paintings is "The Burial of the Count of Orgaz," and we visited the tiny church of Santo Tome, where the painting holds court and thousands of tourists have paid homage. We couldn't resist a stop for pastry filled with almond cream. Churros, flan and chocolate filled buns are also famous here, as well as an almond flavored cheesecake Keller pronounced "fabulous." we descended a series of well worn stairways, wending our way down to Toledo's squares, plazas, bakeries, craft shops and churches. church. 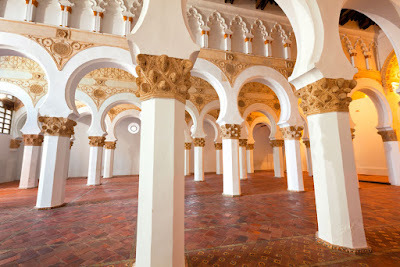 It was built as a synagogue in the 1100s by Moorish craftsman. Entering the Moorish Bisagra Gate and Sol Gate, built in Mudéjar style, we found ourselves in the bustling old quarter, where its Plaza de Zocodover is a lively meeting place. On we went to the church for a look at the El Greco painting, one of the most visited paintings in the world. We continued our leisurely walk through the town’s pleasant jumble of streets, down more stairs onto cobblestone lanes. Weathered façades weave Moorish and Spanish elements, testimony to the influences Toledo has embraced over centuries. are part of the charm of Toledo. TOLEDO'S MOST unusual building was one that has served as synagogue, church and mosque. Muslim workers built it for the Jewish community under a Christian regime back in the 12th Century. Although designed in Moorish style, it incorporated Jewish symbols and the central arch with its lovely scallop design served to store the congregation's Torahs. Now a museum, it is known as Santa Maria la Blanca and symbolizes more than any other building the blending of three faiths as well as Toledo's surges of disharmony. For while Toledo earned the moniker "city of three cultures" the country's major religions did not always live in peace, as the building's moving history reveals. By the 1400s, anti-Semitism was gathering momentum and Jews were being persecuted throughout many Christian kingdoms. The synagogue was converted into a church, the Santa María la Blanca, with a lone Star of David the sole reminder of the building's earlier purpose. JEWS WERE given three options: conversion, expulsion or execution. Soon the entire Jewish Quarter was deserted. Jews left with only essentials, hoping their exile was temporary, and that they would soon return to their homes, businesses and comfortable life. The wait lasted generations. Our guide told us with great emotion of three tourists he has met from three continents. Generations and centuries later, the three hold their ancestors' keys to homes in Toledo. They pass them on, holding them dear as a sacred symbol of hope and faith. Flamenco is known throughout the world as a symbol of Spain. Very fine piece of writing, cohesive look at a fascinating city. Thanks so much. Knew the key story from friends in Rhode Island who love Toledo. Amazing that the keys are still being passed down. 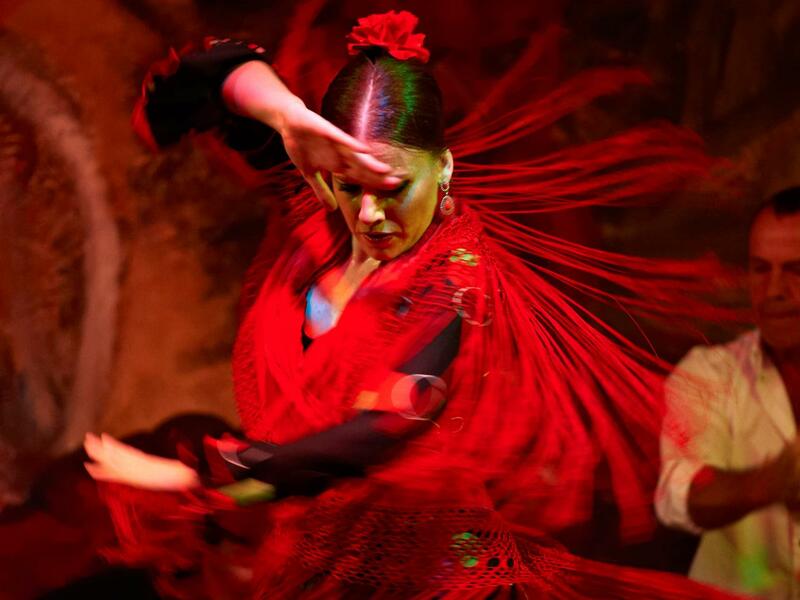 Great job on the history and wonderful art of our favorite spot in Spain.